Kimolos is in the Cyclades islands of Greece, close to Milos. It's the kind of island to head for if you want to get away from it all. It has a year-round population of only about 1,000 people though obviously this swells in the summer months. It covers an area of 36 sq kms (14 sq mi), and its highest point is Mount Paleokastro, which is 364m (1,194 ft). If you want to get a taste for the island first then take a day trip from Milos, as there are several ferries a day in the summer months. 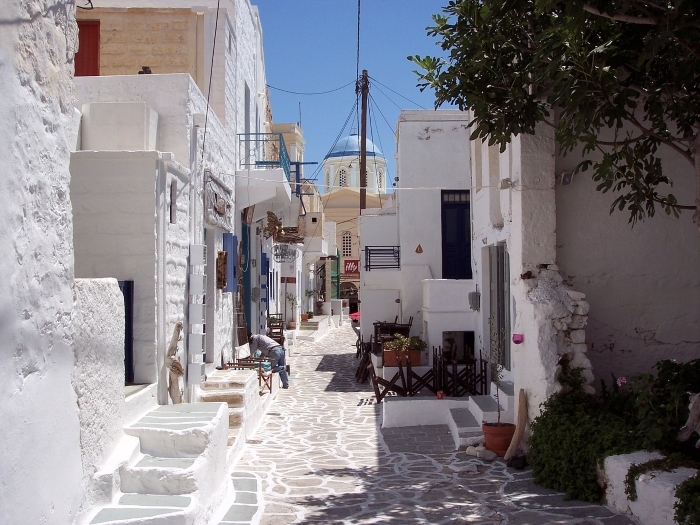 If the laid-back lifestyle of Kimolos appeals, you may find yourself heading back there for a longer visit. It's an island for hiking and sunbathing. There are several good beaches, the best being the white-sand beach at Prassa. 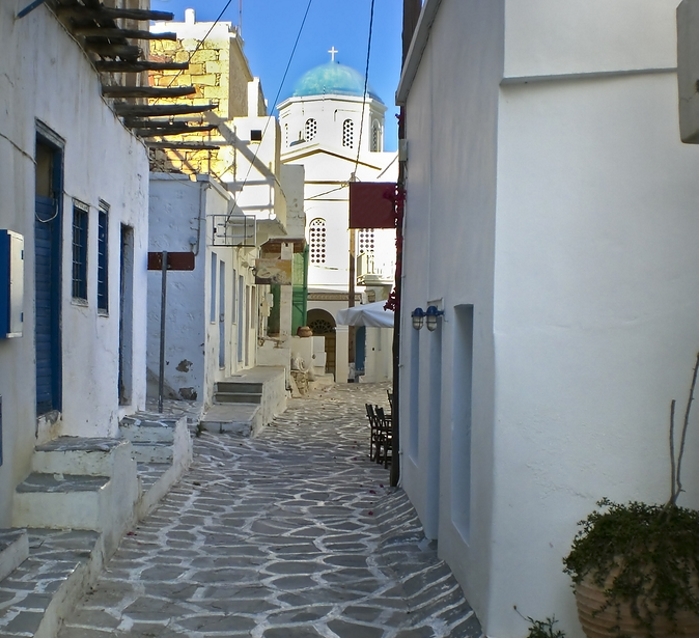 Most people stay in the main town of Hora, where there's accommodation and eating places. There's also a medieval castle, inside which is a 16th-century church and a small local museum. You will find accommodation and eating in summer at some of the island's beaches too, and around the harbour at Psathi. One of the island's few notable features is a stone known as Skiadi. This peculiar mushroom-shaped rock has been created by the action of the wind, which has carved away the softer lower layers more deeply than the harder upper layers, creating a mushroom shape. 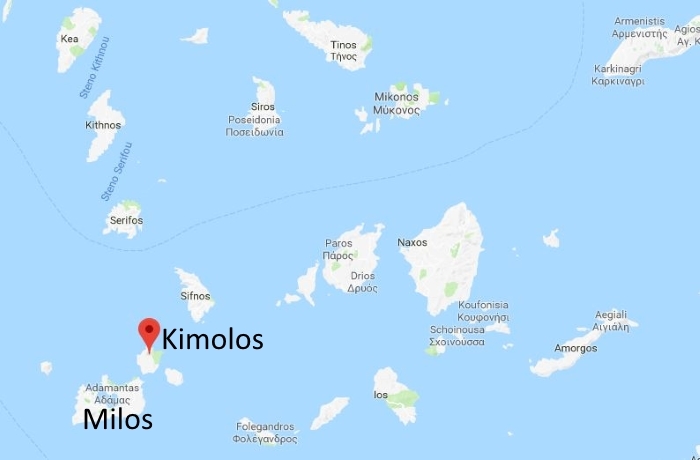 Kimolos has no airport so you will have to fly to Milos and take a ferry from there. Check ferry timetables for ferries going to Milos. Some of these also stop at Kimolos, with usually one a day from Piraeus in high season. Otherwise go to Milos first and then take the regular car ferry that runs between Pollonia on Milos and Psathi on Kimolos. This is a daily ferry that operates several times a day in summer but less frequently in winter. It takes about thirty minutes: www.kimolos-link.gr/en. In summer buses run the 1.5km (1 mile) between the port of Psathi and the main town of Hora (also called Kimolos). Out of season you'll have to walk or call a taxi. See the Go Kimolos and Discover Kimolos travel websites, and the official website for the Municipality of Kimolos.